This photo at [gsh34] has the following caption: " The 'Emanuel', flying a Palestine flag, anchors at Southampton, England. This Jewish trading vessel was the first to fly her country's new banner. Palestine, under British mandate, has a badge (see No. 419), but its Jewish population has created this flag of their own  Solomon's seal on a field of blue and white. The flag in the picture appears to be blue over white with a large Magen David set near the hoist and counterchanged in colors. In its center appears the letter 'H' in an unknown color but obviously not blue or white. The photo is black and white. In 1934 it was reported that the Steam Ship Emanuel flew a Zionist flag described as being Solomon's Seal counterchanged in the centre of a light blue over dark blue flag. Source: Public Record Office, Kew: CO 323/1333/1. The flag in [gsh34] is blue over white, the seal shifted to the hoist, lower part of the seal blue, top of the seal looks golden or similar, not white. Proportions: not evident, c. 2:3. Here is a scan. Does it says to which company this ship belonged? The Zionist flag was already official in 1934, so my guess is that was a houseflag. I hadn't noticed the photograph in the [gsh34]. The flag is not on an ensign staff but being held out from a pole lashed to the hand-rail. It must be a temporary arrangement as the pole is obstructing a fair-lead and also a boom. The description of the flag was "light blue over dark blue", while in the photograph it is a dark colour over a light colour. However this is easily explained. The photograph was taken in England. The crew are observing the local custom, and holding the flag upside down. The lighter colour could be a very light blue. It is certainly darker that the white life-buoys. However, the photo in [gsh34] shows it flying from the staff at the stern. But also it is clearly a staged photograph. 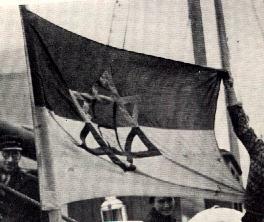 Possibly the ship sailed under a recognized ensign and only temporarily placed the Zionist flag in the ensign position as a political statement. The story of the Emanuel and moreover, the story of its captain Arye 'Lyova' Grevnov who designed the flag is quite unique. Emanuel was not a steamship but a twin-mast 200 GRT scooner and the flag was first hoisted in 1933. Soon after it was photographed in National Geographic, the ship was lost in sea never to be found again. Arye 'Lyova' Grevnov founded a shipping company named Hofiya (God's Sea shore) and hoist a blue-white flag of his design. On 30 January 1934, the Emmanuel sailed from Poole (UK) and never seen again. The 21 years young captain and his crew of six were lost at sea. I am the sun of Grevnov niece, i.e he was my mothers's uncle and the brother of my grandmother. I also research and write items at Hebrew Wikipedia. Captain Grevnov was born in 1912 in the Ukraine and in 1922 at age 10 his family immigrate to Tel Aviv. At age 16 he finished his studies with excellence. In 1928/9 he went to Belgium to study at the Antwerp Maritime Academy and at age 19 he was authorized as "kapitein ter kustvaart", captain in coastal shipping. He founded a shipping company named Hofiya, and crossed Europe until he arrived to Aalburg , where he purchased ad 52 years old 200 GRT scooner that was previously used for research at the Nord Sea. The ship was a wreck and with a crew that he brought from Eretz-Yisrael (Pelestine-Israel-land) the vessel was fixed and became sea worthy and he moved to Aarhus. Meanwhile, the ladies of Aarhus Jewish community of Aarhus made him a flag. See a clip from Danish newspaper at wikipedia. The ship took a load to Antwerp, but in its way there was a storm and the ship was ran aground. A Dutch steamer tow them to Antwerp and while waiting to fix the vessel he and his crew stay with the Jewish community which made him another flag. After paying the needed ransom, the ship sail to Southampton. 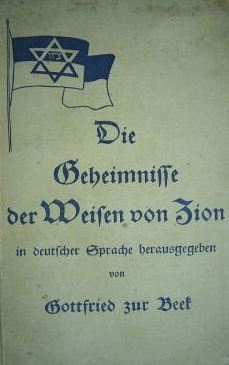 Its arrival and its flag were published in the parers and they received visits from the leaders of the Jewish community. Photo at wikipedia. The ship sailed to Poole port where it took a load to Greece. Two crewmen refuse to sail and were substituted with two foreigners. The Emanuel sailed on 30 January 1934, never to be seen again. My suggestion is that the design of the flag was influenced by the flag that appear on the cover of the anti-Semitic publication "The protocols of Zion elders" that was printed in Nazi Germany. I suggest that when Grevnov passed via Hamburg in its way to Denmark he saw this publication and and as defiance, he used this design as basis to his flag. I have no proof for that, but the resemblance of the flags and my knowledge of Grevnov views, are the basis to this calculated guess. The photo at Southampton show the Antwerp flag, but it was stolen from the ship when the crew went to a synagogue and in its last voyage the hoist the Aarhus flag. More info at <maritime-museum.org.il> and Hebrew wikipedia.